“All the News That’s Fit to Print” was a viable business model for many years at the New York Times, but these days, as newspaper costs rise and readers look elsewhere for their information, the Grey Lady is focused on stepping up its digital game. 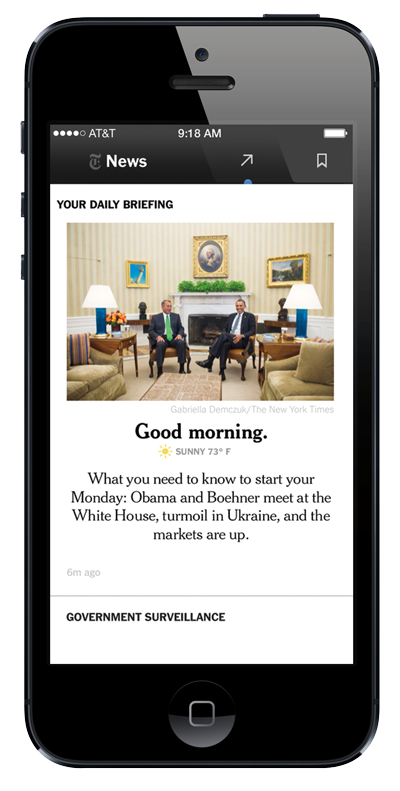 Today that strategy took a big step forward, with the launch of NYT Now. The new, paid mobile app for iPhone and iPod, debuting April 2, will cost $8 per month, and will focus on aggregation and curation, with editors selecting stories from the NYT and the wider Internet for a “fast and engaging news experience.” It also marks the NYT’s biggest move away yet from regular display advertising, with all ads on NYT Now in the form of “Paid Posts,” NYT’s term for native advertising — or advertorial, as it used to be called. Alongside NYT Now and the Paid Posts, the NYT also announced a top-end product called Times Premier, with extra “behind the scenes” benefits and all-content access. Costing $45 per month, it’s aimed at power users and (most likely) the business market where the cost might get expensed. This effectively makes NYT Now and Premier the bookends to the NYT’s current range of subscriptions that run at between $15 and $35 per month. A spokesperson declined to say when NYT Now may be available for the iPad or other platforms. Speaking at the FT Digital Media conference in London, NY Times Company CEO Mark Thompson noted that this is the next step in the company’s longer-term plan to push digital products to make up the declines in more legacy areas. In that area, according to ComScore, as of Feb 2014, NYT had 42 million worldwide unique monthly visitors to NYTimes.com, with about half of its traffic coming from mobile — that includes apps and the mobile web. In January 2014, it counted 27.6 million downloads of our smartphone apps and 11.2 million downloads of our tablet apps. But converting those volumes to paid users has been tricky. New York Times, as of December 2013, had 760,000 paid subscribers to its various digital subscription packages, e-readers and replica editions of The New York Times and the International New York Times. Of course, these are far from the first moves that the NYT has made in this area. Back in 2012 it partnered with Flipboard to offer its paywalled content via the popular mobile app. Flipboard has also jumped headfirst into native advertising, although it doesn’t look to be involved here from what I can see. A spokesperson for the NYT tells me that the creative “is developed either by the brand, or by the team in our content studio (which sits on the commercial side of our business) in close collaboration with the brand.” In the case of Cartier, NYT Now’s launch sponsor, Cartier developed its own creative, she added. NYT Now also marks the first time that the NYT has assembled a team of editors dedicated only to a mobile product, the company notes. Cliff Levy will lead a team of 10 editors. Other sections will include a Morning Briefing and an Evening Briefing, part of NYT Now’s “daily tip sheets” covering World, National, Business, Culture and other categories. 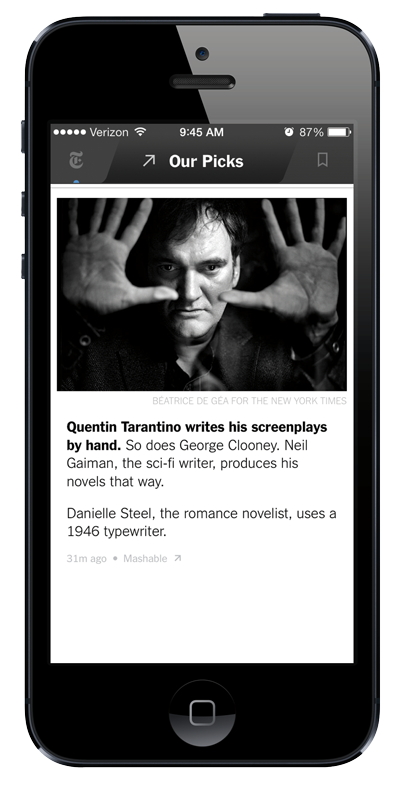 “Our Picks” will aggregate stories from other publications. The standalone subscription for NYT Now includes unlimited access to the new app, but the NYT notes that all existing print and digital subscribers will get it free as an added benefit. Existing home delivery subscribers can get Times Premier for $10 extra per month.